The Paris Spiritwear store is open for a group order this week! We have 2 fun new shirts in the store, a Paris Boys Basketball Championship T-shirt to commemorate the historic season the A, B and C Teams posted. The imprint is metallic gold and white on our Essential Cotton T-shirt, with all of the team rosters on the back. 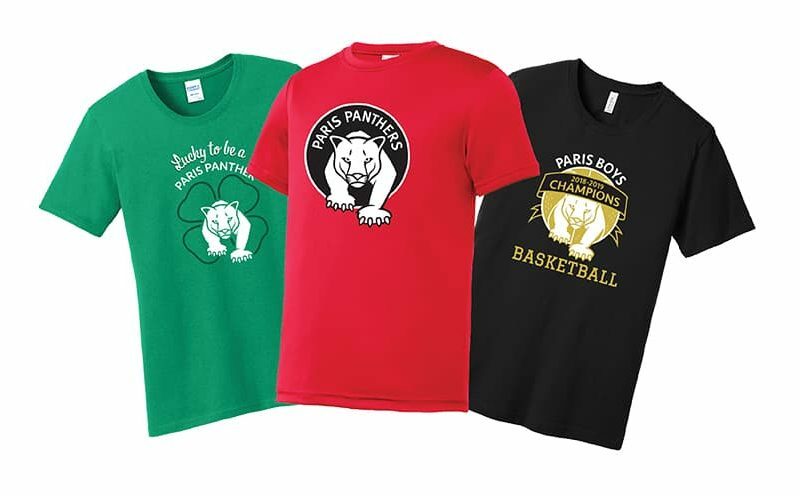 The second new item is the Lucky to be a Paris Panther T-shirt for the St. Patrick's Day holiday season. Both designs are available in Youth, Ladies and Adult cuts. In addition to those items, we are offering all of the great screen printed products we had for our December Sale, including the bright red performance shirts everyone loves! We will keep the store open for orders through 8:00 PM Monday, February 25. Products will be delivered to students at school in time for the St. Pat's holiday weekend!